NASA is yet to release any information as to why the latest RS-25 test in December aborted just seconds into what was set to be a full duration firing. The lack of information partly relates to NASA employees being out of work during the current government shutdown, which has also impacted on the test schedule. However, prime contractor Aerojet Rocketdyne notes they can accommodate a “temporary” delay. The RS-25 will be the main engine on NASA’s next flagship rocket, the Space Launch System (SLS), which is using tried and tested heritage hardware from the Space Shuttle era. The engine involved with the latest test was the Development Engine 0525 (E0525). This engine is being used on the latest set of firing to help validate engine components – built by prime contractor Aerojet Rocketdyne – using modern, updated manufacturing techniques aimed at reducing the cost to build new “production restart” engines for delivery in the early 2020s. As such, this test series is not wholly critical to the opening launches of SLS, albeit pending the reason and potential impacts relating to the test abort. Numerous RS-25 hot fires have taken place on the A-1 test stand at Stennis. Testing from 2015 through most of 2017 helped to certify the already-built “adaptation” engines and a new engine control system to the SLS flight environment. However, beginning in December 2017, the focus of RS-25 ground testing shifted to development and certification of the “production restart” design. Engine 0525 is one of two development engines that have never flown in space and won’t be used with the opening salvo of launches with SLS. The new rocket will first use up the stock of Space Shuttle flown veteran engines that were handed over after the conclusion of the Space Shuttle Program. 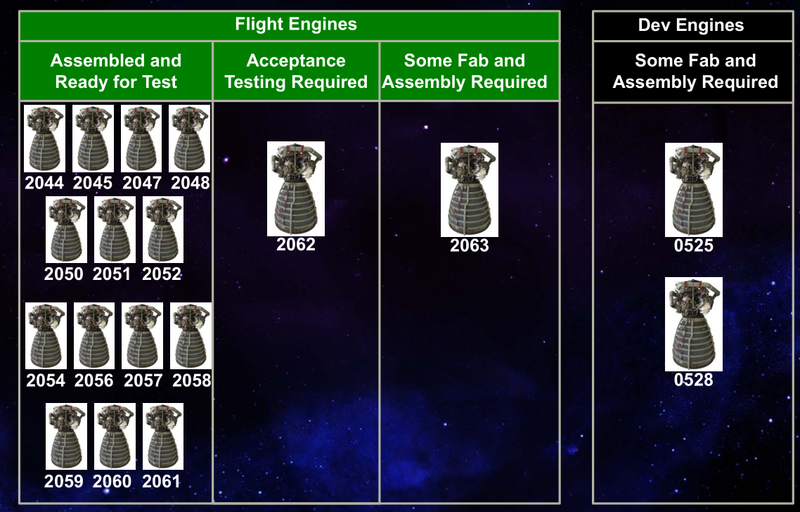 Four engines have been selected for each of the opening missions, with another set of four placed on standby. The first four RS-25s that will fly have already been selected for the Exploration Mission -1 (EM-1) maiden launch of the SLS. They are currently housed at the Stennis Space Center ahead of eventually being installed on the first core stage for a key validation firing on the B-2 test stand at the facility. This “Green Run” test will be the first time four RS-25s will have been fired up together and will act as a major milestone ahead of the core stage’s shipping to the Kennedy Space Center (KSC) for launch preparations. The four RS-25 engines slated for Exploration Mission-1 (EM-1), the first SLS launch, at Aerojet Rocketdyne’s Stennis facility in October, 2017. Credit: Aerojet Rocketdyne. The Shuttle engines – known as RS-25Ds – were designed to be reused numerous times. Once the stock of RS-25D’s has been exhausted, currently expected to be in the second half of the 2020s based on the current SLS launch schedule – SLS will start using the expendable version of the engine, sometimes called the RS-25E. The expendable engine will be cheaper to manufacture and will adopt several elements of modern manufacturing, such as the inclusion of some 3D printed components – such as the pogo accumulator assembly. The tests have also been putting the new engine controller units (ECUs) through their paces. The engine also sports a new insulation system for the high-pressure fuel turbopump (HPFTP), which some experts have speculated could be a likely suspect for the observed fire that was seen coming from the powerhead before the engine shut down during the December test. Immediately after the abort, NASA Stennis sent out a one-line media advisory acknowledging the abort and adding safing of the engine and test stand were in progress. “A scheduled RS-25 engine test at NASA’s Stennis Space Center experienced an early shutdown. Post-test securing and processing are in progress,” noted Stennis. While Aerojet Rocketdyne forwarded requests for information to NASA Stennis, no specific information was provided. NASA employees – bar some relating to the ISS and other critical operations – then became the subject of the government shutdown, ending any hope for a full update for the foreseeable future. The last communication from NASA only added the abort was manually triggered from the control room and that an investigation was still being conducted. A couple of early shutdowns have occurred during previous RS-25 hot fire tests. However, each of those have been classed as “facility” issues, where the test stand, not the engine, was at fault. The latest abort appears to be specific to the engine, pending confirmation from NASA or the contractor. That contractor, Aerojet Rocketdyne, did provide a statement this week, albeit specific to the shutdown and not the reasons for the RS-25’s aborted test. The key element of that statement is “temporary” as an extended shutdown will undoubtedly feed into the forever-shaky SLS schedule. Current projections for the maiden launch date of SLS and Orion on EM-1 have slipped every year, with the current challenge of keeping this launch in 2020, as opposed to the growing potential of slipping into 2021. One of the critical paths on the SLS schedule is the Core Stage, which will host the four RS-25s. 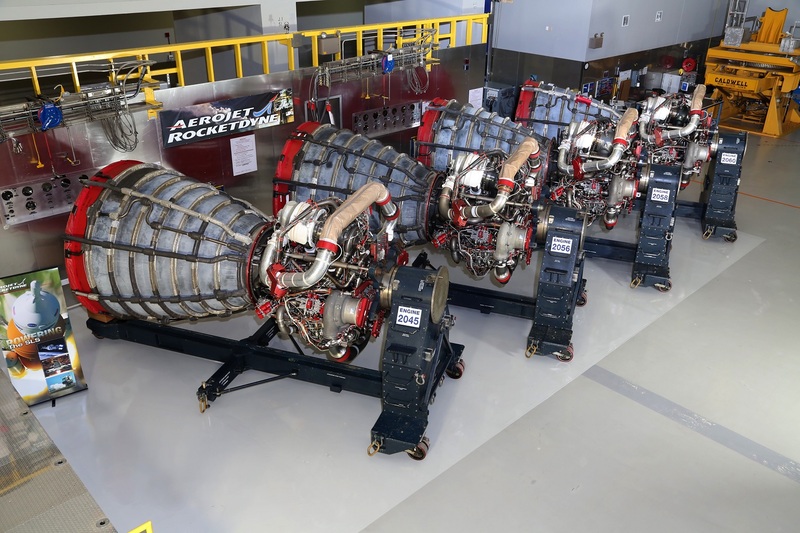 Ensuring the engines have concluded their test series, be it for the upcoming flights and/or future iterations as an expendable unit, could play into the Core Stage schedule. The most positive news was the safe shutdown during the abort, which showed the test stand did not suffer any obvious damage and the engine didn’t “blow up”. This lack of a dramatic failure was referenced by former Space Shuttle Program manager Wayne Hale. The next RS-25 test was set to take place over the coming days, although that has obviously been postponed indefinitely due – at least – to the government shutdown.